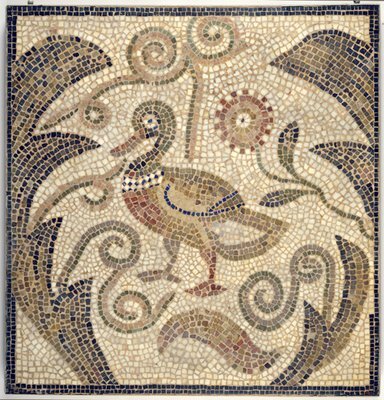 In 1883, French soldiers digging a garden for their captain behind his home in what is now Tunisia accidentally uncovered an ancient mosaic floor. 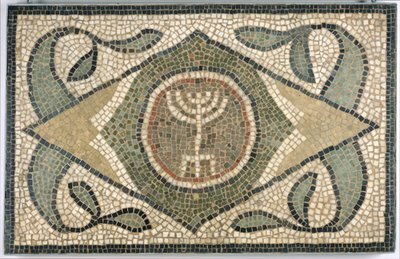 It is believed to have been the ruins of a Jewish synagogue apparently built over the 1st to 6th centuries CE (AD). 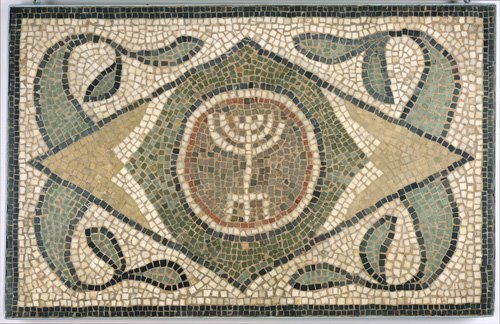 The find provided a glimpse into life of the Jewish Diaspora in the early centuries CE, and its integration into Roman society. Some 40 supporting objects provide contemporaneous cultural context – small fraying textiles patterned with loping hares, gold earrings from Egypt, a giant linen Coptic tunic decorated with strips of patterned wool weavings, classical sculptural fragments including a head of Athena. It’s a charming, but modest show. And though there’s much here, one can’t help wincing at the floor’s gaps, which remind that the temple floor was broken up and divided. The overwhelming impression is a sense of what has been lost. “Tree of Paradise: Jewish Mosaics from the Roman Empire,” McMullen Museum at Boston College, 140 Commonwealth Ave, Chestnut Hill, Feb. 17 to June 8, 2008.